SOMBRERO is a colorful oddity from MGM, released on DVD earlier this year by the Warner Archive. SOMBRERO tells three intertwining love stories of varying degrees of interest. 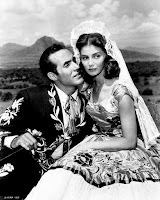 It's disclosed early on that wealthy Alejandro (Vittoria Gassman) is dying of a brain tumor; he loves the peasant woman Maria of the River Road (Yvonne DeCarlo) but is forced by duty and class position to marry the socially acceptable Elena (Nina Foch). Ruben (Rick Jason) is a candy peddler who falls in love with Lola (Cyd Charisse), whose matador brother (Jose Greco) is strangely possessive of his sister, considering her his good luck charm. The most lighthearted story concerns Pepe (Ricardo Montalban), a wild prankster who makes the greatest cheese in Mexico. He falls in love with Euphemia (Pier Angeli), whose father (Thomas Gomez) is the mayor of a rival town and will not agree to their marriage. The film is overlong at 103 minutes, with some dull, slow-moving passages surrounding some interesting and quite enjoyable sequences. Highlights include Pepe crashing Euphemia's birthday party to romance her on the sly and Lola's solitary wild dance ridding herself of guilt over a death; Charisse fans will want to catch this film in order to see her solo number. Montalban gets to do a bit of pleasant singing, but the film is light enough on music I don't think I'd describe it as a musical. SOMBRERO was filmed on location in Mexico and features exquisitely beautiful Technicolor, starting from the eye-catching red, green, and yellow opening credits. The movie may not be for everyone due to the sometimes sluggish storytelling, but I found it worthwhile for its great look, including unique Mexican exteriors, along with its handsome cast and brief musical interludes. 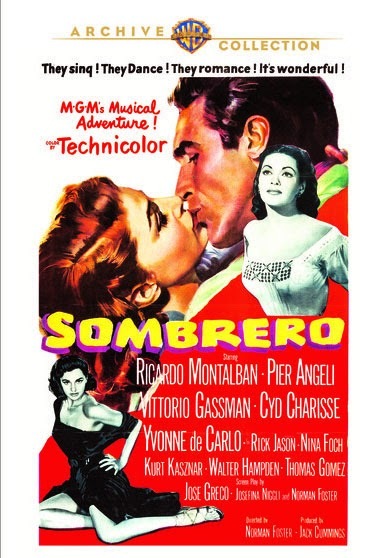 SOMBRERO was directed by Ricardo Montalban's brother-in-law, Norman Foster, who had made movies in Mexico in the mid '40s. The two men were each married to one of Loretta Young's sisters, Montalban to Loretta's younger half-sister Georgiana and Foster to their older sister Sally Blane (aka Elizabeth Jane Young). The Warner Archive DVD features gorgeous color, filmed by Ray June, and is a real visual treat. There are no extras. I remember watching this one a few years back. I watched it for Rick Jason (one of the stars of Combat!) and remembering being amused by the whole movie, but I don't remember any details now. I don't know if I could do a good job of articulating exactly why, but I have great affection for this movie. It goes back to seeing it in 1953 and I was pretty young then, enough that the more somber stories dealt with realities that were almost over my head though the movie made them clear enough, so in juxtaposition to the more lighthearted part of it, I did respond to those just as much--of course it didn't hurt that Yvonne De Carlo was so beautiful, and the other two female leads as well. The Technicolor was really gorgeous in this too, just mesmerizing--those were still great days for Technicolor!--so it all had a wonderful mood. I think I also liked (and still do) the intermingled stories; that's a kind of storytelling that very much appeals to me. For one thing, as I just noted and as your review also makes clear, the different stories have a mingling of moods, and I like movies that go from light to dark, funny to serious, gay to sad, and back again. It's hard to do well but a gift a lot of the greatest directors have. This movie directed by unheralded Norman Foster did it pretty well. Then, too, there is that spectacular dance by Cyd Charisse. Cinema often touches or reaches the sublime when Cyd dances! Though his career does not seem that impressive at first glance, Norman Foster is an interesting figure--he had been an actor and was in Ford's PILGRIMAGE and King's STATE FAIR in younger days and came over pretty well. Later, he was associated with Orson Welles and under Welles' supervision directed a segment in Mexico ("My Friend Bonito") of Welles' never finished documentary IT'S ALL TRUE, as well as the not-so-great JOURNEY INTO FEAR. But some of his other directed movies in addition to SOMBRERO are pretty good--RACHEL AND THE STRANGER is a beauty, almost documentary-like NAVAJO an unusual contemporary Indian movie, and the recently lauded film noir WOMAN ON THE RUN is very good too. Glad to hear that SOMBRERO is out on Warner Archive in what sounds like a nice edition, with the color as it's supposed to be. I did see the movie again as an adult on TV but it was pretty washed out then and not the same experience. I'm basing my opinion on that earlier memory and will want to look at this DVD sometime.